A Dutch Study has shown previously that coffee consumption was reducing the risk for developing diabetes. Now Dr. Salazar-Martinez and co-workers have confirmed this in a study involving even larger numbers of both men and women. This was published in the Annals of Internal Medicine and the research team is from the Harvard School of Public Health, Channing Laboratory, Harvard Medical School, and the Brigham and Women’s Hospital, Boston, Massachusetts. A total of 41,000 men and 84,000 women from the Nurses’ Health Study and the Health Professionals’ Followup Study were followed between 12 and 18 years. 1,333 men and 4,085 women developed diabetes during the time of observation. All of the data was analyzed carefully by controlling for other factors such as obesity, smoking, high blood pressure etc. to be certain that the only difference in the observed groups was the amount of coffee consumed. According to the authors the gender differences are probably unimportant and may have to do with the different sample sizes. However, as the graph shows clearly, with the consumption of around 4-5 cups of coffee per day there is a significant 30 % drop in risk to develop diabetes. 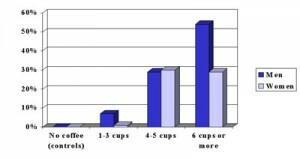 The Dutch Study showed a 50% drop in risk with 7 cups or more per day and the study here suggests a similar drop with 6 cups or more. Dr. Frank Hu, associate professor of nutrition and epidemiology at Harvard School of Public Health, who co-authored this study stated that physicians should still recommend to patients first to exercise and to loose weight to control diabetes. 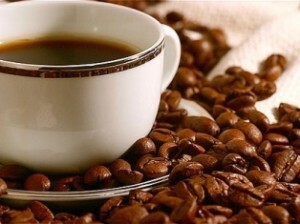 It would be premature to recommend heavy coffee consumption to patients for diabetes control. This beneficial effect was also observed to a lesser extent with decaffeinated coffee, but not with tea. According to Dr. Hu caffeine, chlorogenic acid and magnesium likely play a role in the protective effect with regard to diabetes prevention. Further studies will be done to see whether diabetes patients who drink coffee have a better outcome when they develop a heart attack. The placebo control group showed no change in blood values. The effect documented in this table was achieved after 40 days of cinnamon exposure and was “washed out” after 20 days. Other experiments had found that the substance MHCP (methylhydroxychalcone polymer) is the active ingredient in cinnamon that stimulates insulin and also acts on insulin receptors similar to insulin. 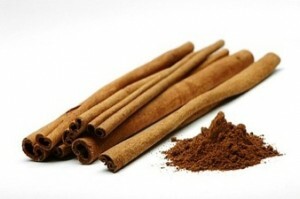 Dr. Richard A. Anderson and his colleagues at the Human Nutrition Research Center of the U.S. Department of Agriculture had already published a number of medical papers on the effects of cinnamon. He was the co-author of this study from the Department of Human Nutrition, NWFP Agricultural University of Peshawar, Pakistan. The interesting observation here is that several cardiovascular risk factors (blood sugar, triglycerides and LDL cholesterol) are simultaneously being reduced with something as simple as cinnamon powder. The authors stated that the cinnamon oil is not effective, only the cinnamon powder or a cinnamon stick dipped into tea (the water soluble component of cinnamon or MHCP). Dr. Anderson also warned not to make the mistake to eat more cinnamon buns or apple pie as there would be unhealthy amounts of sugar, starch and fat added. He suggested that the best to do instead would be to simply sprinkle cinnamon powder over whatever you are presently eating, as this will reduce the risk of getting diabetes or will reduce the risk of a heart attack in diabetics. This article based on: “Cinnamon improves glucose and lipids of people with type 2 diabetes.” Diabetes Care – 01-DEC-2003; 26(12): 3215-8. Here is a link to diabetes mellitus (type 2 diabetes). The metabolic syndrome is a new disease entity that is known to be associated with obesity. In order to make the diagnosis of metabolic syndrome at least 3 of the 5 components listed in the table under this link (hypertension, hypertriglyceridemia, low high-density lipoprotein cholesterol level or LDL cholesterol, high glucose level, abdominal obesity) have to be present. 1. if there was a significant reduction of the filtration capacity of the kidney. 2. if there was critical leakage of blood protein into the urine. 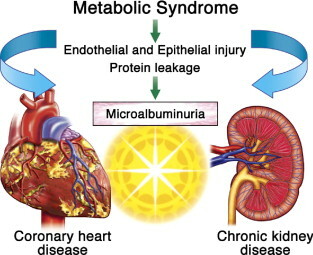 Depending on how advanced the metabolic syndrome was (all 5 criteria of metabolic syndrome positive versus only 3 or 4) there was a higher or lower risk of developing chronic kidney disease. I have depicted the results of this study in bar graph form here. It shows clearly that chronic kidney damage occurs in a dose-response curve pattern depending on how severe the degree of the metabolic syndrome is. With 5 factors of the metabolic syndrome present the risk to develop reduction in filtration capacity of the kidneys is almost 6-fold. This is 3-fold higher than in a person with a milder degree of metabolic syndrome where only two factors are present. Such a person would only have a 2-fold risk for developing chronic kidney damage (dark blue shaded bars in graph). A dipstick urine test can measure protein in urine, which is an alternative way to measure kidney damage due to the metabolic syndrome. These values followed a very similar dose-response curve (light blue shaded bars in graph). The authors of this study believe that the kidney damage inflicted by the metabolic syndrome is different from that caused by high blood pressure or by diabetes. Future studies will have to establish whether this type of kidney damage can be repaired by treating the metabolic syndrome with a low glycemic, calorie restricted diet coupled with exercise. Based on an article published in: Ann Intern Med 2004:140:167-174. Dr. Michael Dansinger reported at a recent annual meeting of the American Heart Association about a study where he compared the effect of 4 major diet plans on the lowering of risk factors for heart disease. Dr. Dansinger is the director of obesity research at the Tufts New England Medical Centre’s Atherosclerosis Research Lab in Boston. Originally, the objective was to see whether any of the following four diets investigated would be superior: the Atkins diet, the Ornish diet, the Zone diet and the Weight Watchers diet. In the table below there are links for each of these diet plans. Briefly, the Atkins diet is a high protein/low carbohydrate diet; the Ornish diet is a vegetarian/low-fat diet; the zone diet is a low-glycemic load/balanced protein/low fat diet; weight watchers is a calorie restricted diet. 160 obese patients were divided into 4 groups and assigend to one of these four diet plans. They were instructed in the type of diet plan they were to follow in 4 couselling sessions in the beginning of the weight loss program. The participants ranged in age from 22 to 72 years of age (average age 50) and had on average starting weight of 220 lbs. They were to follow the diet plan for 2 months strictly and were allowed to follow less supervised for another 10 months. To the surprise of the research team under Dr. Dansinger they all lost about the same amount of weight (average of weight loss 10 lbs or 5% of body weight), in other words they were all successful with any of these programs and none was superior. Below are the results in modified tabular form. Dr. Dansinger indicated that the focus would now have to shift from “which is the best diet plan” to “which is the best diet plan for a particular patient”. The doctor should attempt to fit the weight loss programs that fit patients’ food preferences best and that patients can easiest fit into their lifestyle. This will hopefully lead to the lowest dropout rate. This trial showed that the Zone diet and the Weight Watchers diet had the least dropout rates. But those who stayed on the Atkins or Ornish diet were successful with their weight loss program also, as these may have been fitting these patients best. In other words, if the one diet plan does not work satisfactorily, try another one. The common denominator with all food plans was some form of calorie restriction despite all of the differences. Based on The Medical Post, Dec. 16, 2003 (p. 15). 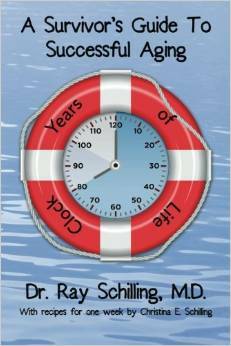 Here is a link to the Net Health Book’s weight loss and diet chapter. You do not need to spoil your appetite with the thought of swallowing cod liver oil, but see yourself enjoy a piece of salmon instead. Dr. Jehangir N Din and collegues published an article entitled “Omega 3 fatty acids and cardiovascular disease—fishing for a natural treatment” in the first January edition of the British Medical Journal (BMJ 2004;328:30-35,January 3, 2004). These cardiology researchers from the University of Edinburgh/England have reviewed all of the recent medical literature regarding the beneficial effects of omega-3-fatty acids on heart disease. The following are some facts they found. The interesting story regarding the omega-3-fatty acids, which have anti-inflammatory qualities, is that they balance the detrimental effects of the omega-6-fatty acids, which lead to inflammation not only in joints, but also in blood vessels. In the standard North American and European foods the omega-6-fatty acids are overconsumed. To counter the bad effects of the omega-6-fatty acids, more omega-3-fatty acids need to be ingested. 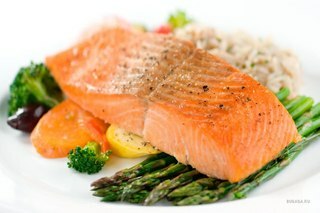 So, what should we consume in terms of omega-3-fatty acids? The American Heart Association made the recommendations in the second table below. Current consumption of omega-3-fatty acids in North America and Europe is low. Recently an expert US panel of nutritionists determined that the US consumption per day is about 0.1 to 0.2 grams per day and should be 0.65 grams per day as a minimum according to the recommendations by the American Heart Association. The authors of this paper from England disagree and state that at least 1 gram per day would be needed to lower the heart attack risk to the low levels in Asia. The British Nutrition Foundation has recommended to use 1.2 grams of omega-3-fatty acids per day. How does that translate into how much fish you would have to eat to get about 1 gram of omega-3-fatty acids per day? To make things simpler I have categorized fish and seafood in the table below based on the data from this article into low, medium and high marine derived omega-3-acid foods. You obviously need to eat more of the low category seafood to achieve 1 gram of omega-3-fatty acid than of the high category seafood. Before you overindulge in seafood from the low and medium category, check with your doctor first whether you are allowed so much protein. Some people have protein restrictions due to poor kidney function or because of gout. The authors of this study stated that you should eat a seafood meal with 1 gram of omega-3-fatty acid twice per week. Other sources of omega-3-fatty acids (=alpha-linolenic acid) are plant products such as soy beans,flaxseed, walnuts and rapeseed oil. In Asia fish and soy bean products are consumed in much bigger quantities than in the US. A study entitled “Maternal consumption of coffee during pregnancy and stillbirth and infant death in first year of life” by Dr. K. Wisborg et al. 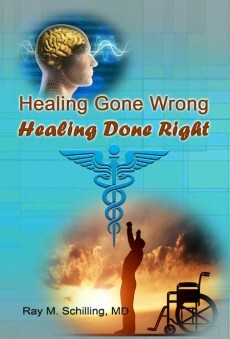 was published recently in the British Medical Journal (BMJ 2003; 326: 420-423). The pregnancy outcome of 18,478 women who completed a questionnaire at their first prenatal visit was studied. They were asked about coffee consumption and the following 4 groups were identified: group 1 consisted of the 43% of women who drank no coffee. Group 2 (34%) drank 1-3 cups per day, group 3 drank 4-7 cups per day (18%). Group 4 drank 8 or more cups per day (5%). “Food affects your mood” is the heading of an article by Dr.Susan Biali (practising family physician with a degree in dietetics) in the June 24, 2003 edition of The Medical Post (page 24). According to her there is good evidence in the medical literature to indicate that a number of biologically active brain hormones depend on what we eat. There are 5 major items that she pointed out, which I summarized below in tabular form. The medical literature points to the importance of these various food factors to allow us to have a balanced brain metabolism. When these ingredients are present our mood is more likely to be normal with more resilience to depression. The literature centers around various population groups in comparison with the North American population. For instance, in an article of the Dec. 2000 issue of Psychiatric Clinics of North America a study was reported that found that Taiwanese and Chinese people consume a lot more omega-3 fatty acid rich foods such as fish than North Americans. In the same study the rate of major depression was found to be 10-times more frequent in North Americans and the investigators felt that this was so because of the brain hormone stabilizing effect of the omega-3 fatty acids. Other researchers suggest that chronic stress might lead to a depletion of omega-3 fatty acids in the brain through an oxydation process, which eventually results in depression. Several nutritional factors appear to have caused deficiency states of essential brain nutrients, one being the junk foods like candy bars, French fries, hamburgers etc. leading to a dysbalance of the omega-6 fatty acid to omega-3 fatty acid ratio. Another factor is the increase of consumption of highly refined carbohydrates (sugar and starch), often also called high glycemic foods. This is known to lead to the metabolic syndrome, also called syndrome of insulin resistance. Finally many people still have too much fat in their diets with a high amount of hydrogenated vegetable oils (see link). 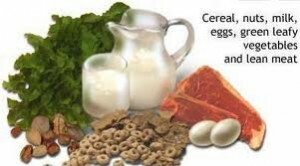 It is also important to note that folate, Vit. B6 and Vit.B12 are required for prevention of hardening of the arteries by lowering homocysteine levels. 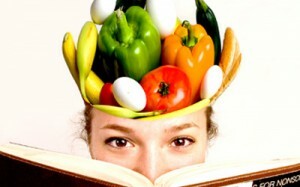 So what is “brain food” ? Dr. Biali pointed out in her article that it is always best to start with a low fat, well balanced food plan where junk foods are avoided and where vegetables and fruit provide the low to medium glycemic index carbohydrates. Fish should be eaten at least three times per week to provide the brain with the essential omega-3 fatty acids. It is probably not recommendable to take tryptophan as a supplement: in 1989 several fatalities occurred from impurities in commercial tryptophan and many researchers are concerned about dysbalancing the network of brain hormones by giving an overdose of only one amino acid, but not giving enough of the others. It is much safer to simply eat enough protein (meat, soy protein, milk products) and the body can pick and choose what it needs in terms of amino acids including tryptophan. With folates one needs to be careful not to exceed 0.8 mg per day as with mega-doses of folate in the 15 mg range toxic symptoms of vivid dreams, disturbed sleep patterns and even occasional seizures developped. A good multivitamin supplement will not only provide the right folate dose, but also Vit. B12, which is also needed to prevent depression. The May 2003 issue of the medical journal “Clinical Practice” contains an article by the dietician Andrea Miller (pages 46 to 49) about supplementation with these vitamins in relation to hardening of the arteries from too much of the amino acid homocysteine. Homocysteine is an amino acid that contains sulfur, which is formed from the metabolism of methionine, an essential amino acid that we depend on in our food for maintaining a normal metabolism. There are complex metabolic pathways that involve several enzymes to function normally, which involve the three vitamins B-6, B-12 and folic acid (folate) to balance everything. 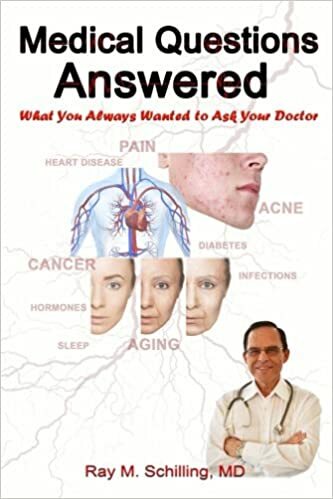 If one of these vitamins or any of the enzymes involved malfunction, a surplus of homocysteine results with an accelerated hardening of the arteries throughout the body. A certain percentage of the population does not have the full concentration of one or more of the metabolic enzymes in their system. If the food we eat is also relatively deficient in the above named vitamins, the body runs out of alternative metabolic options and produces dangerous levels of homocysteine. A normal blood level of homocysteine is between about 5 and 10 micro-mol per liter. This is not routinely measured by screening tests unless the doctor suspects a genetic trait in the family where family members tend to get heart attacks at an early age (mid 30’s to early 40’s). When the level of homocysteine is elevated to 12 micro-mols per liter, a supplement with folic acid of 1 mg per day would reduce this by 25% to safe levels of 9 micro-mols per liter. This results in a 15% decrease of the death rate from heart attacks. Vitamin B-12 is found in animal products such as meat, poultry and dairy products. Vegetarians may not get enough Vit. B-12 and should supplement as should persons above the age of 50. A lack of B-12 vitamin leads to pernicious anemia. Vitamin B-6 is found widely distributed in meat, fortified grains and poultry and usually is in our food supply to a satisfactory degree. 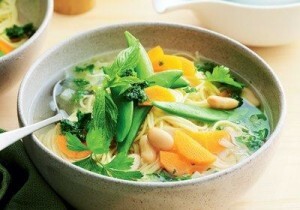 Folate (folic acid) is contained in orange fruits, beans, lentils and green vegetables. However, not everybody eats well banced meals and the food supply could be marginally deficient in folate. Recommendation: The take home message is that a good multivitamin tablet containing about 400 to 600 micrograms (=0.4 to 0.6 mg) of folate (folic acid), 5 mg of vitamin B-6 and 20 micrograms of vitamin B-12 would be providing an adequate amount of these vitamins and reduce homocysteine levels in most people to safe levels. It is not recommended to take single vitamin supplements of these vitamins as this could lead to toxicity. Also, there is no point in taking higher doses of the vitamins as this also would lead to toxic reactions. Do Diet Drinks Make You More Hungry? 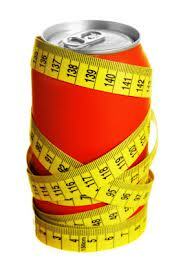 There were some articles recently that stated that diet drinks would make you hungry. However, they lacked proper controls. For this reason the gastroenterologist, Dr. Khursheed Jeejeebhoy, from the University of Toronto/Ontario designed a well controlled 10 week trial where several parameters were measured while patients were either snacking on diet drinks or on sugar containing soft drinks on top of their regular food intake, which was also closely monitored. The only requirement in the beginning of the study was that the subjects had to be overweight (body mass index of 27 to 28). Participants of the study were then divided randomly into subjects drinking soft drinks with either sugar or sugar substitutes. The drinks were blindly given, but meticulous records were kept of what was consumed. In addition the subjects were allowed to eat as many snacks as they liked with either sugar in it or sugar substitutes. Below is a tabular summary of the findings. The surprising findings were that the sugar group had an increased appetite and wanted to eat more and more. Sugar also raised the blood pressure significantly. The result was a significant weight gain during the 10 weeks of the trial while the other group (AS) had lost a significant amount of weight without any hunger pangs. The researchers also measured body fat versus muscle mass and found that the sugar group (SG) had gained fat mass without changing the muscle mass. On the other hand the atrtificail sweetener group (AG) had lost only fat mass, not muscle mass. from drinks per day: AS: 250 Cal. SG: 870 Cal. Comment: Not every diet drink is medically safe. Aspartame and Sodium cyclamate are brain excitotoxins. One of the safest alternatives to sugar is Stevia. Read this review about sugar alternatives.